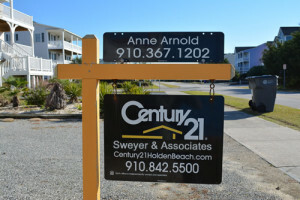 Anne Arnold with CENTURY 21 Sweyer & Associates has over 27 year of experience in selling property in coastal Brunswick County including Holden Beach, Ocean Isle, Sunset Beach, Calabash, Shallotte and Oak Island. Selling your home involves much more than just placing a “For Sale” sign in your yard and going to the closing. This is why sellers have hired real estate agents to handle the details for them for the past 200 years. We enjoy helping you prepare, market, and sell your home. We do our best every day to help our customers succeed. We offer multiple listing options, enabling you to choose the most economical way to sell your home. You can even participate in the selling process if you so desire. We keep communication with you open. Price – If your home is priced too high, you must be willing to wait much longer for your home to sell. Either it will take that much longer to find someone to pay more than the home is worth, or the market will eventually catch up to the “asking price” of the home through inflation. After deciding on a price, try the old retail trick – drop the number down a bit. Instead of placing the listing at $900,000, drop it down to $899,999. Time – If time is important then you must be willing to lower the price. REALTOR® – Choosing the right REALTOR® who understands your needs and can manage the process smoothly is imperative. As long term residents here, we understand your needs and we are highly educated in real estate for Holden Beach and the surrounding towns of Brunswick County. We believe in working with you to ensure a smooth sale with the least amount of inconvenience.